Whether it’s commuting to work, traveling to school, shopping for groceries, or going on a vacation; transportation is ingrained in our day- to-day lives. Yet very rarely do we think about the roads that make it possible for private, public and commercial vehicles to get from one place to another. The transportation infrastructure of the United States is worth trillions dollars and about one-third the value of all fixed assets; this includes about 2.5 million centerline miles of highways paved using asphalt mixtures. The social, economic and environmental impact of our roadways cannot be overemphasized. Just how much is 2.5 million centerline miles of asphalt? Think of it this way: it would take about 10 seconds at the speed of light to cover this distance, or roughly five trips to the moon and back. The IMPACT (Infrastructure Materials Performance And CharacTerization) lab. 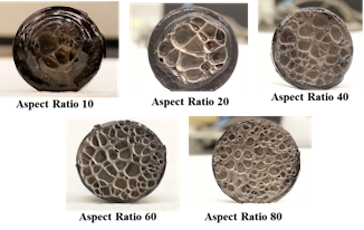 at UT Austin was set up in 2008 with core testing facilities to help solve this puzzle. Simple test methods to characterize damage in asphalt binders and composites. Investigating crack nucleation in asphalt binders. 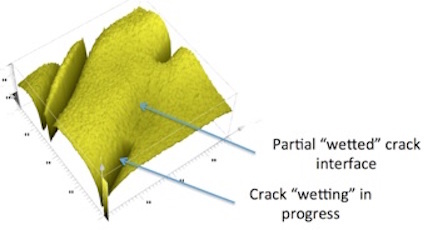 Energy methods to characterize fatigue cracking in binders and asphalt composites. Nonlinear viscoelastic response under dynamic and static loading. Influence of confinement on stress state, crack nucleation and crack growth in asphalt binders within a composite. Damage evolution under multi-axial stress state in mortars. Simplified method to measure both healing and fatigue damage using a single test protocol. Influence of physico-chemical properties of asphalt binders on its ability to heal. 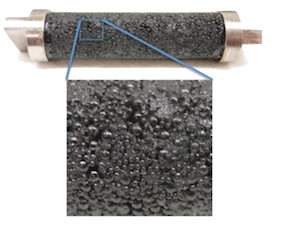 Influence of temperature and aging on the ability of asphalt binders to heal. 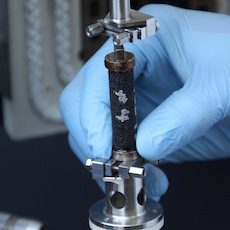 Continuum approaches to quantify healing in asphalt composites. How different chemical fractions contribute to the microstructure, stiffness, strength and healing characteristics of asphalt binders? How does fatigue damage (plastic or cracking) accumulate? Some of the tools useful in this research are the Atomic Force Microscope (AFM), micro beam fatigue apparatus (indigenously developed), and computational tools such as molecular dynamics simulation.